The HEKA Olympic 360/S hatcher is the ideal complement for our HEKA Olympic models 770 and 880. 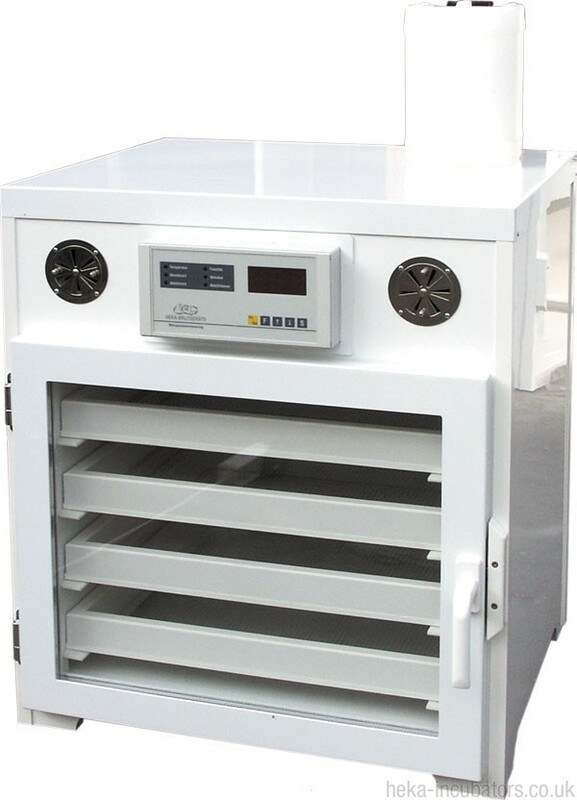 Having the same overall dimension, this hatcher can be easily placed on top of the setter incubator. The casing is made from hygienic synthetic material for easy cleaning, particularly important for the hatch of your chicks. The hatcher is equipped with the same reliable computer control system as in all the other models of this series. The convenient control panel allows the user to adjust the temperature and humidity easily. The hatcher is fitted with a water pipe and water canister, but there is provision in your order to state if you would like to connect the appliance straight to the water supply, this will be fitted by us at no additional cost. All HEKA Olympic hatchers have a fully automatic humidification system. It includes a water canister, which is the water reservoir for the humidification. A float valve regulates the water supply from the canister to a water container with a heater. Every time while heating (continuously at heating up and in short impulses when set-temperature is reached), the water heater is activated, which heats the water and evaporates it. This is a failure free and reliable technique for best success in brooding. It's also possible to connect the incubator directly to your water supply. If you request this, we then adjust your machine for this higher water pressure. We provide the most reliable control unit on the market, with absolutely precise results, giving a temperature failure rate of less than 0.1% in the first 5 years - a figure which the incomparably high hatching results confirm. All breeding machines in the HEKA Olympic series are equipped with double glazing. The insulation value is much better in comparison with single glazing, and uses less energy. Also, insulated glazing does not begin to steam up until higher than ~80% humidity, and higher values are not normally required. The hatcher is fully equipped with all the accessories that are needed. Included is an interior light, four hatching-baskets of your choice (you can choose hatching baskets with covers to be certain that you are able to identify your hatchlings), and a detailed manual. You can also opt to have a connection to the mains water supply instead of the water canister supply.